Italy has not disappointed any of its visitors yet. It is a wonderful country that inspire a historically inherent feelings of romance, admiration and love. If you want to make the dream of a fabulous Italian castle wedding a reality, then it is better to entrust its organization to professionals. Wedding-Italian coordinators will select the best venue for an official ceremony or symbolic marriage. We are created to inspire you to the birth of a beautiful marriage union, which is designed to bring success to life together and fill it with the charm of love and romance. To feel the distinctive atmosphere of the celebration, the castle will be the perfect place to hold wedding ceremonies in Italy. Here you will feel like a real royal family. A pleasant atmosphere with a magnificent view will give grace to your celebration. We will help to organize a fabulous wedding in the best castles of Rome, Tuscany, Sardinia. The greatness and amazing architecture will not leave indifferent anyone of your guests. Castello Di Pomerio is a picturesque and exciting place for celebrations. There is an abundance of greenery, territory for performances, lawns for cutting the cake, a beautiful veranda for the first dance and groom, and a lush interior of the rooms. Castello Rocca Dei Cavalieri - is an oasis between antiquity and modernity. There are: a huge olive park, swimming pools, lakes with beautiful landscapes, lots of gazebos and fountains. Castello Camemi is a stately castle with stone-lined floors, old fireplaces, an elite interior and stately chandeliers. It amazes with its wealth and strength. Castello Papadopoli Giol - neo-gothic style impresses with its high towers, large windows and the magnificence of the surrounding park. There is a three-tier fountain and four stately lions at the foot recline on the territory. Castello Bevilacqua is a castle with an atmosphere of comfort and refined luxury. Historical places are a great setting for wedding photos. 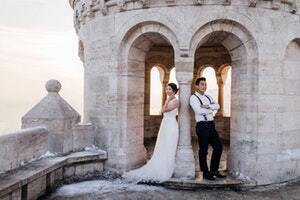 Castello Scaligero is a stately castle at the foot of the Southern Alps on Lake Garda for getting married in Italy. From the gazebo of the castle offers a stunning view of the coast and the panorama of the medieval city. How much cost of the organization of the royal celebration? Wedding Italian agency is ready to plan the wedding for any couple in love. Below, on this page, you can define your costs, which are the best acceptable for your wedding. For example, you can define your budget as medium, high, or VIP, and automatically see the price for each service. You are free to choose as many services as you wish, but there is a minimum of options, for each category, which is necessary to be selected to meet our agency’s etiquette. More answers to your questions will give you our main coordinator, Marina Matasaru.